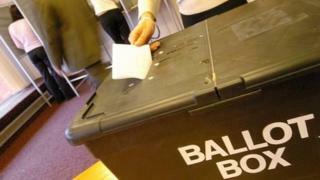 The election for a ward of a Derbyshire local council has been suspended after one of the candidates died. The ballot in the Swanwick Ward of Amber Valley Borough Council will now be held on 26 June. Conservative councillor Patricia Lynne Watson was due to stand on 22 May. Nigel Mills, MP for Amber Valley, said the chair of Swanwick Parish Council, who died suddenly at home last month, was "committed to delivering improvements in the village". "I'm sure she would have made a great borough councillor," Mr Mills added. Councillor Mary Barnett, vice-chair of the parish council, also paid tribute describing Ms Watson as a "much loved and wonderful friend and colleague". The funeral service will be held at 12:00 GMT on 20 May at Markeaton Crematorium, in Derby. Local elections will be held in 161 councils in England on Thursday 22 May 2014, the same day as voting in the European election. Video Local and European elections: What matters more?